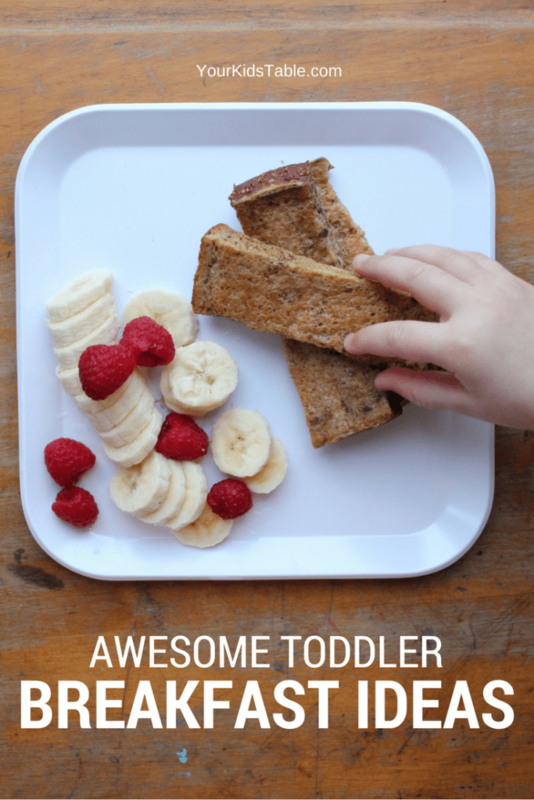 Amazing toddler breakfast ideas that are easy and healthy. Take the stress out of your morning and get peace of mind with more than 15 ideas that your toddler will gobble up. Ugh, I hate that feeling when I’m standing at the refrigerator door staring inside and hoping that a brilliant toddler breakfast idea is going to leap out at me, all the while the toddler that I’m trying to feed is nearly pulling my pants down as they try to climb my legs. The constant crying and whining make it hard for me to think straight. I want to throw another piece of toast in the toaster, but I don’t want him to eat the same thing every day. I’m losing patience and I need an idea for breakfast fast! Years ago to save my sanity I literally wrote down all sorts of breakfast ideas for toddlers and would simply rotate through them. It has been a total lifesaver. But, it can be hard to think up easy and healthy breakfast ideas for toddlers because they can’t always eat what bigger kids do, and they can also be a little picky! I’m pulling in my OT feeding-toddler hacks and the real-life practicality of a mom that’s been through this 3 times to give you the greatest breakfast ideas for toddlers! 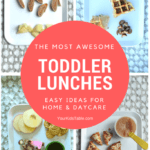 Grab a post-it note and write down your favorite ideas and grab my free toddler meals printable at the end. Within each of these toddler breakfast ideas, lots of quick changes can be made to make the recipes more home-made or store bought, if you’re short on time. You can also mix and match different sides so you don’t get stuck in a rut of serving the same thing all the time. Also, if you’re looking for even more breakfast ideas, especially for older children, head over to Breakfast Ideas for Kids. Make your favorite french toast recipe (or try this one), but instead cut your bread into cubes or strips first. Not only will this make it easier for you when you sit down to eat, your toddler will be able to eat independently a lot easier. Make your scrambled eggs in a mini muffin tin and your toddler doesn’t have to worry about the slippery eggs falling through their fingers and onto the floor. You could also add diced mushrooms, onions, sausage, etc. Toast is a great go-to toddler breakfast idea, but we don’t have to stop at butter. There are tons of topping that we can smash and smear on to the tops so that toddlers get loads of protein and nutrients. This is one of my favorite’s. Here are some more toast topping ideas. There’s are so many ways to maximize the “healthy-ness” of pancakes. The recipe above is an awesome way to do that. Heck, you can even do gluten-free pancakes easily. One of my other favorites for toddlers breakfasts is muffin tin pancakes. 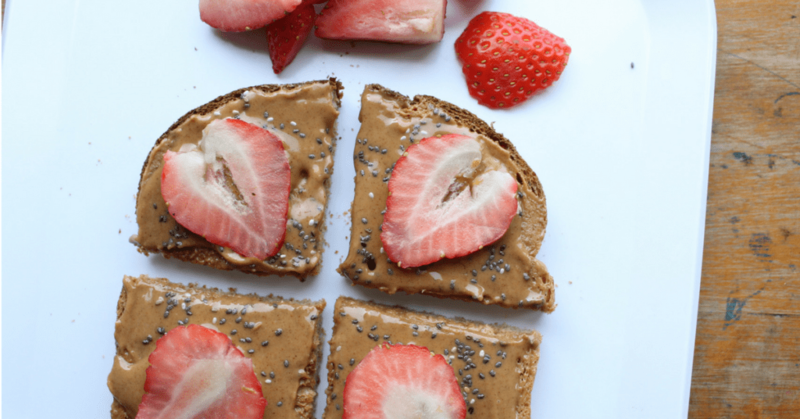 Skip the syrup and use this healthy waffle recipe to make peanut or almond butter sandwiches. Just spread your favorite nut butter in between two pieces of waffle and dice up. Put diced up leftover veggies, scrambled eggs, and some cheese inside of a tortilla. Press flat in a heated pan then cut into thin triangles. I like to use plain whole fat yogurt and add some ground flax seed (if you aren’t sure what that is, you can check it out here on amazon) in for more nutrition. If the yogurt is too sour for them I add a little bit of honey. Then think about a healthy whole grain, low sugar cereals to serve alongside the yogurt. These Spoonfuls cereal are a staple in my house. Spread peanut butter thin, too thick and it could be a choking hazard. I add these tiny crunchy chia seeds that are so good for them. They are hardly detectable, can you see them in the picture above? A perfect gluten-free (if you’re looking for that or even if you’re not!) toddler breakfast idea that is packed with protein. If your toddler will drink around 6 ounces of a nutritionally sound smoothie, this could be a quick breakfast idea for a toddler. Not all toddlers will drink that much if that’s the case make sure you add something to go along with it! We make this recipe all the time, it can be made as a bread or muffins. Spread a nut butter, cream cheese, butter, or leave plain. Steel cut oats are awesome, but instant works too if you’re tight on time. I like to buy plain and add my own honey, flax seed and cinnamon. Make it pretty thick so toddlers can get it to their mouth without too much trouble. But, a mess is likely. And, that’s okay, read why here! Toddlers tend to stuff large pieces of bacon into their mouth and could choke (see help for baby gagging if this is something you’re concerned about). Break the bacon up into little pieces. Dice or slices potatoes and sautee in a pan until lightly crispy. Lightly toast a whole wheat english muffin and smash cheesy scrambled eggs into the top and cut into pieces. Look for mild tasting breakfast sausages unless you know your toddler likes a little spice. Serve with homemade or store-bought hash browns. It’s no secret that feeding a toddler can be frustrating and messy. 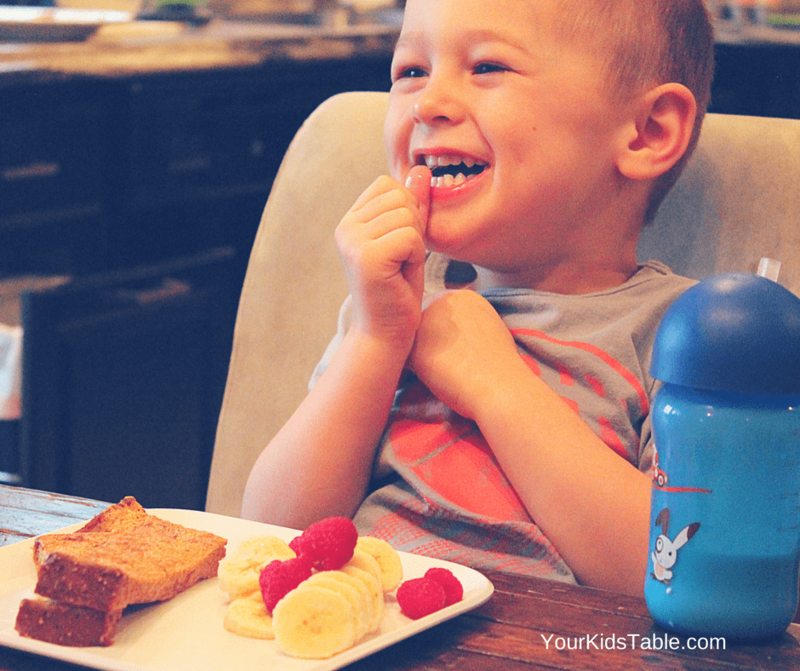 But, there are a few tricks you can use to not only make breakfast time easier with your toddler, but also teaching them good eating habits and avoiding picky eating. If you already got a picky eater on your hands, you’re in the right place. Head over to why kid’s don’t eat to learn how to start helping them. Think sticks and cubes – If you ever have the option to cut your toddler’s breakfast into a stick shape or cubes, it will be much easier for them to handle. Watch the milk– Toddlers are often in the process of weaning or still heavily rely on milk as part of their nutrition. To teach them how to eat well, it’s helpful to move to a toddler feeding schedule that includes them drinking milk with their meal not beforehand. If you aren’t sure how much milk your toddler should be drinking then click the link for lots more! Don’t be afraid to think outside of the box – While you got a lot of toddler breakfast ideas here don’t stop there. Once you start experimenting with new ideas you may be inspired. It’s also okay to serve dinner foods for breakfast, no one’s going to call the meal police. Focus on offering a variety and a balanced meal. Include fruits and foods that you may not typically eat – We tend to give our kids the foods we eat. That’s totally normal. But, the next time you’re in the grocery store look around the produce department, is there something new you could try? Even though you may not like kiwi, your toddler could love it! Now’s your chance to stay low sugar – While I don’t want any parent to be hyper paranoid about too much sugar, because that’s not good either, now is an awesome time to shape your child’s palate. Lots of seemingly “healthy” foods have sugars added into them, just like yogurt and instant oatmeals. Take a look at the packages your buying and find the lowest sugar count when you can. 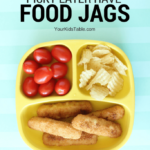 You know you’re going to want to find this one again save it to your toddler or meal ideas boards. Pin it here!